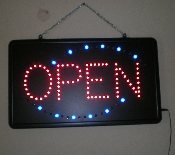 LED open sign . 110 power , looks great . Sure to be noticed from the street. $78.00 Plastic Sign that says Thank You For Not Smoking $6.00 includes postage to the 50 States.